We can supply untill 30 kilos per month of Rough Moganite Brazil Stones has great crystallization and color, this classification of morganite is very good to collection use. TOPIC 1: Morganite is a rare, pink semi-precious gemstone of the beryl family of minerals. Beryl is the mineral beryllium aluminum cyclosilicate. It's hexagonal crystals are transparent, except when another mineral is present that adds color. In the case of morganite, which is also called pink or rose beryl, it's manganese that gives it it's pinkish hue. The larger gemstones are more prized since their transparent pink color tends to be more pleasantly intense than the colors of smaller stones. Many large morganite stones are a cool light pink to medium rose that is paired with white gold in jewelry designs. Some stones of this gem are more of a warm salmon pink that better suit yellow gold jewelry settings. While morganite is suitable for use in many different types of jewelry, it shouldn't be used for rings worn daily because these are likely to become scratched or chipped. Whereas rings worn on the hands are likely to be banged around a bit, gemstones in a necklace or earrings usually receive less wear and tear. Diamonds are often used for rings worn daily, such as a wedding ring, as the diamond rates a perfect 10 for hardness on the Mohs scale. The Mohs scale is used to evaluate the hardness of gemstones to determine their durability for use in jewelry. Morganite only measures a 7.5 on the Mohs scale. A morganite stone should never be marketed as a pink emerald because it isn't one and it's illegal to represent it as such. Emeralds are beryls as are aquamarines and heliodors. Aquamarines have an icy green-blue color, while heliodors are more of a rich green-yellow. Morganites are usually sold at a reasonable price, but they are rare and not easy to find on the market. Morganites are found naturally in countries such as Afghanistan, Brazil, Madagascar, Namibia and Russia. Some American states are good sources of morganites, including California and North Carolina. Due to its rarity, morganite tends to be collected more than it's sold. The gem was known as pink beryl until 1911 when it was named for the gemstone collector and banker John Pierport (JP) Morgan, by the gemologist George Frederick Kunz. At the time, Morgan was the biggest customer of Tiffany's, the New York jewelry company. Cool pinkish morganite stones are often sold as pink or rose beryl. Warmer morganites may be marketed as peach or champagne beryl. TOPIC 2: Morganite, also known as Pink Beryl, Rose Beryl, Pink Emerald and Cesian Beryl, is a light pink to salmon-pink gem quality beryl. Morganite was first recognized as a distinct variety when specimens were first discovered in southern California in 1911. The pink beryl was named after J.P. Morgan, the American financier and gemstone collector.With pink a fashion favorite, morganite is a gem that is much in demand. It is a hard and durable stone with a pastel color that ranges from clear pink to a lovely peach. If it reminds you of the beauty of aquamarine, that's not surprising since they are the same mineral.The price and value of morganite varies depending on the size and quality of the gemstone. The more saturated colors are more valuable, as are very clean and well cut specimens, especially in larger sizes. Color Pink, champagne pink, peach pink, pastel pink, rose, Morganite is found in all shades of pink. Beryls are beryllium aluminium silicates rich in minerals. Pure beryl is colorless. However, on account of its structure, it is in a position to intercalate foreign elements such as iron, manganese, chrome or vanadium. If manganese is intercalated in beryl, the rather plain, colorless gemstone turns into an enchanting pink treasure: morganite. Many sources attribute morganite's color to the element manganese in interstitial sites in the beryl's ring structure. Other references attribute the color to the element cesium. The chemical formula of morganite is: Be3Al2(SiO3)6 beryllium-aluminium silicate. The chemical composition of beryl is beryllium (14%) aluminium (19%) silicate (67%), usually containing alkali ions, other minerals, water, and gases. It has refractive index values of 1.57 to 1.58 with weak dichroism. Cleavage is absent to poor in one direction. The hardness is 7.5-8 on the Mohs hardness scale, and the specific gravity ranges from 2.66-2.83. The refractive index (RI), measured using a refractometer, is an indication of the amount light rays are bent by a mineral. Birefringence is the difference between the minimum and maximum RI. When birefringence is high, light rays reflect off different parts of the back of a stone causing an apparent doubling of the back facets when viewed through the front facet. Most gems have a crystalline structure. Crystals have planes of symmetry and are divided into seven symmetry systems. The number of axes, their length, and their angle to each other determine the system to which a crystal belongs. Morganite crystallizes in hexagonal shapes, known as habit, and is in the dihexagonal-dipyramidal class of the Hexagonal crystal system. Beryls sometimes crystalize in well formed hexagonal prisms with pedion (flat) terminations. Its good hardness of 7.5 to 8 on the Mohs scale is the reason for its excellent wearing qualities. Color When determining the quality of a morganite, the color is the most important criterion. Note that this gemstone should be selected in as large a size as possible, for it is only above a certain size that the beauty of its color really comes into its own. The rule which says 'the more transparent, the more valuable' only applies to a certain extent, for there are plenty of gem lovers who prefer a morganite with fine inclusions like pure silk. There are morganites in many fine pink hues. Some are decidedly pink, whilst others tend more to lilac or orange. In nearly every case the color is pastel and subtle. Like many other pink gems, morganite looks beautiful set in white gold. The warmth of its color means it also works well in yellow gold, blending beautifully with blue, celadon, peach, yellow, lilac and other rich pastels. Cut Morganite gems are generally cut similar to other colored stones, with ovals, cushions, trillions and emerald cuts being most common. Other popular loose morganite gemstone shapes include rounds, marquises, briolettes, hearts and pears. What is certain is that the cut really is a decisive factor, for only a high-quality cut will allow the subtle color of the morganite to shine out. Treatments Morganite is sometimes heat treated to remove traces of yellow. Morganite was first discovered together with other gemstone minerals, such as Tourmaline and Kunzite, in California in the early twentieth century at Pala. This started a bonanza for these quite popular gemstones which drew the attention of George Frederick Kunz, knowing Pink Beryl was quite a rarity. Kunz knew that this rich pink gem was something exceptional and he bought all he could. It was Kunz who, in 1911, suggested to name the pink variety of Beryl Morganite, after his biggest customer - J.P. Morgan. Ever since, the stone has held a certain popularity with Tiffany's though it still remains a relatively scarce gem. Although morganite was also discovered in 1908 in Madagascar and there are also deposits in Brazil, Mozambique, Namibia, Afghanistan, Zimbabwe, Pakistan, USA and Russia, it remains relatively rare. In fact, its rarity keeps it relatively affordable, since it isn't available in enough quantity to cut in standard sizes and use in manufactured jewelry. Morganite remains a connoisseur gem, for those who are willing to seek it out for its unique combination of soft shades and very good hardness. Morganite is occasionally be found in large sizes: the largest faceted morganite is a 598.70-carat cushion-shape from Madagascar in the collection of the British Museum. Originally, the name 'beryl' came from India. It was derived from the Sanskrit word 'veruliyam', an old term for the gemstone chrysoberyl, from which the Greek word 'beryllos' later developed. Varieties of beryl have been considered gemstones since prehistoric times. Recognized for its beauty, in the Bible, in Ezekiel 1:16, the wheels of God's throne are described as having the appearance of "gleaming beryl". In ancient times, colorless beryl was used to make eyeglasses. Legend says that beryl was once used to ward off demons and evil spirits and that it can protect the wearer from dangers whilst traveling. 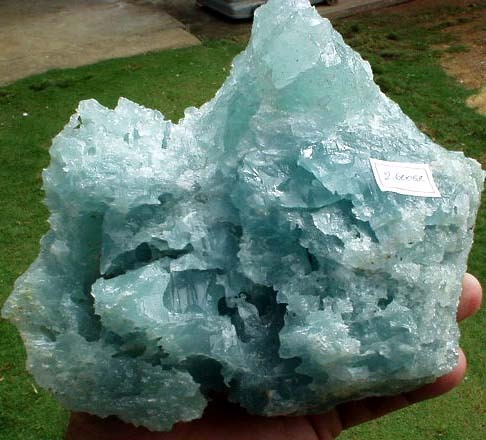 Other legends also state that beryl can be used to bring about good luck, cheerfulness, energy, and eternal youthfulness. Beryl had been used as a physician's tool and gazing stone since ancient times. Those beliefs persist today. Beryl is metaphysically attributed with the ability to cure a number of intestinal and stomach ills, such as nausea, ulcers, and seasickness. It is also said to be effective at treating disorders of the heart and spine.